PETA Pranks Londoners, Could You Stomach Drinking Dog's Milk? 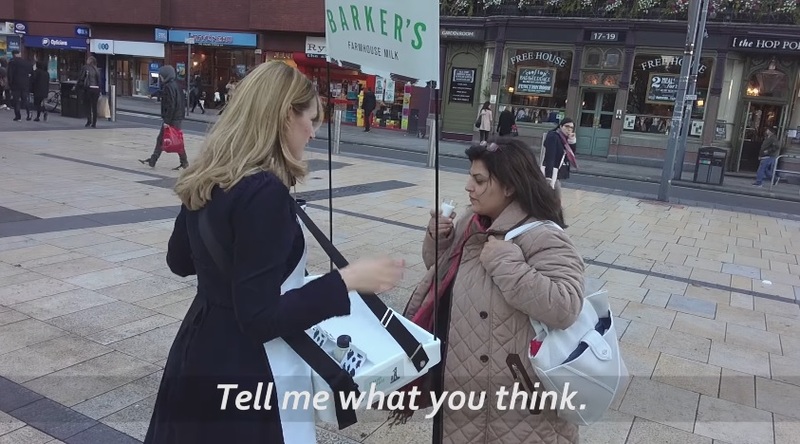 In the latest video from Don’t Panic and PETA UK, Londoners were asked to try a new milk. They were more than happy to offer praise for the creamy drink, but when a disturbing "fact" about the milk was revealed, everything changed. People were disgusted when they were told that the drink (which, we stress, was actually soya milk) came from a dog. But if the thought of drinking dogs' milk makes you feel ill, why drink the milk from any other animal? After all, there is nothing "normal" about artificially inseminating a cow and forcing her to give birth, only to tear her beloved calf away from her so that the milk that nature intended for her baby can be consumed by humans instead. Humans are the only species on the planet to drink another animal's milk, and cows' milk is no more natural for us than dogs' or rats' milk would be. Press: PETA Prank Points Out That Drinking the Milk of Another Species is Nasty London – A focus group for "Barker's Farmhouse Milk" starts off on a positive note, with praise for the creamy white beverage – but once the taste-testers are told they're drinking "dog's milk," the atmosphere curdles, and one woman cries out in dismay, "Would you ever drink that madness?" The new prank video comes courtesy of PETA and asks,"'Dog's' milks, cats' milk, rats' milk, cow's' milk – what's the difference? “Humans are the only species on the planet that drinks another animal’s milk, and cows’ milk is no more natural for us than dogs’ milk”. “Whether from a dog, a pig, a rat or a cow, the thought of drinking another species' milk should turn anyone's stomach"," says PETA Director Elisa Allen. "PETA's prank video reminds consumers that when it comes to milk, plant-based is best." PETA teamed up with top London creative agency Don't Panic for the new campaign, which used soya milk in its production. Plant-based milks made from soya, coconut, almonds, oat, hemp and more contain none of the artery-clogging animal fat and cholesterol of cows' milk, which also often contains traces of pus and bacteria from cows' infected udders. Plant-based milks also spare cows from a lifetime of being forcibly impregnated until their bodies give out and they're slaughtered for cheap meat. AdStasher: PETA Pranks Londoners, Could You Stomach Drinking Dog's Milk?